Kerala PSC Beat Forest Officer Exam Answer Key Today 7.4.2018 : Kerala PSC Beat Forest Officer exam will be held on 7-4-2018. Many candidates from 14 districts will be appeared the exam on April 7th, 2018. 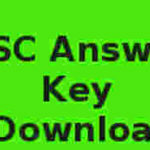 After the Beat Forest Officer exam candidates can download the Beat Forest Officerexam Answer key from PSC website www.keralapsc.gov.in / www.brilliancecollege.com.